I love waffles, but in the interest of practicing a grain-free lifestyle, I have been forgoing one of my favorite breakfasts – until now, that is! 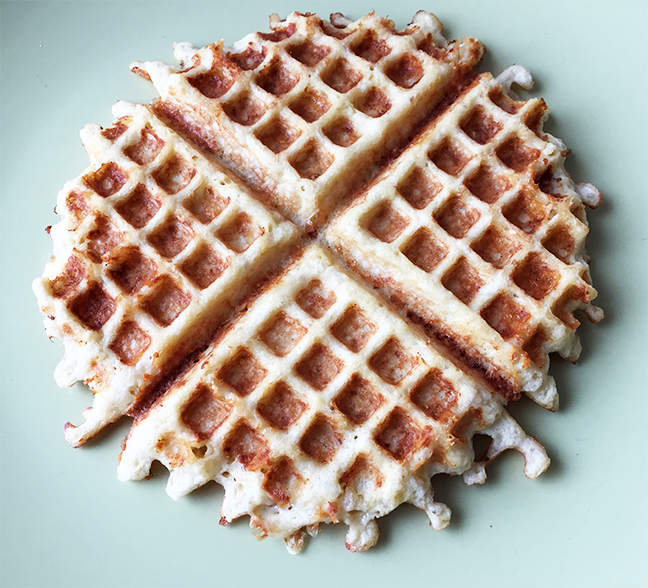 The star ingredient in these waffles is cauliflower, but you sure can’t taste it! They are fluffy, flavorful and delicious. They smelled so amazing, I ate the first one straight out of the waffle iron. I did stop long enough to spread one half with smashed avocado, delish! Later, for lunch, I folded one in half and stuffed it with with bacon, lettuce and tomato. Next, I’m going to top one with prosciutto, a poached egg and Hollandaise sauce – maybe I’ll even add a layer of wilted spinach – yum! Add all ingredients in a bowl and whisk with a fork to combine. Using a ladle or measuring cup, half of the batter into the waffle iron. Cook until the done light goes off. Carefully remove from iron and cook the remaining batter.